Sailing the Hibernian Sea, skirting the shoals of the Ancient Mysteries of the Druids on the one hand and the Lore of the Shamrock on the other, we've found these sites to be useful in searching out what is known and what is not about the earliest folk who spoke the Gaelic tongues, from Eire to Man to the highlands of Alba. The corpus of early Irish tales is preserved in various medieval compilations. The tales fall into four cycles: the Mythological Cycle, or stories of the Tuatha Dé Danaan, the Tribes (or Children, or People) of the Goddess Danu; the Ulster (or Ultonian) Cycle, concerning King Conchobar and the warriors of the Red Branch, including the hero Cú Chullain; the Fenian Cycle, stories of Fin Mac Cumhaill and the warriors of the fiana; and the Historcal Cycle, tales of ancient kings. The manuscripts in which these tales are found are The Book of the Dun Cow (generally ascribed to the 11th century), The Book of Leinster (12th century), The Book of Ballymote (14th century), The Yellow Book of Lecan (also 14th century), and The Book of the Dean of Lismore (15th century). There are also many Scottish manuscripts which supplement these Irish collections, and are particularly rich in tales of Ossian and the Fenians. Irish Mythology, an excellent introduction to the Mythological, Ulster, and Fenian cycles from Bob Reeder. 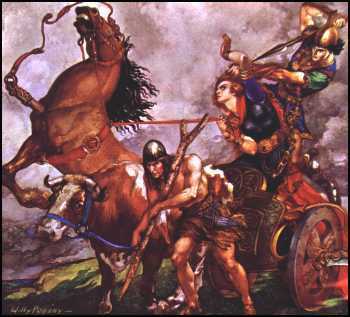 The Irish Literature and Verse "Ancient Tales" pages include "The Conquest of the Sons of Mil" from The Book of Invasions; "The Second Battle of Mag Tured (Moytura)" from the Mythological Cycle; "Bricriu's Feast" from the Ulster Cycle; "The Boyhood Deeds of Cú Chulainn"; "How the Bulls were Begotten," from the Táin; and "The Pursuit of Diarmuid and Grainne" from the Fenian Cycle. The Táin, or in full Táin Bó Cuailnge or The Cattle Raid of Cooley, has been called "the oldest vernacular epic in European literature". This HTML edition pairs an adaptation of the English translation of Joseph Dunn (1914) with the Irish transcription of Ernst Windisch (1905). The Voyage of Bran, Son of Febal, in the English translation from the Old Irish by Kuno Meyer of 1890. New URL. The Ulster Cycle features an introduction, pronunciation, and 52 classic tales, compiled by Patrick Brown. Cuchulain, the Champion of Ireland from Hero-Myths and Legends of the British Race by Maud Isabel Ebbutt (1910). New ! Deirdre of the Sorrows and The Children of Lêr by Megan Powell, at Fables. New ! Oisin and Niamh by Greg Niedt, also at Fables. New ! The Irish Literature, Mythology, Folklore, and Drama site is a comprehensive guide to other Irish resources on the net. Tír Na nÓg, the Virtual Irish Cyber Café.